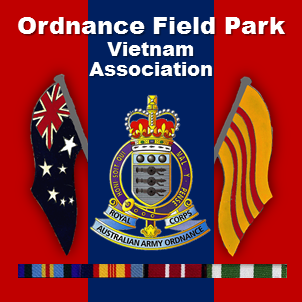 2000 – Gold Coast QLD – Ordnance Field Park Vietnam Assn. Following the reunion at Wodonga in ’99, a few who attended doubted that its success could ever be recaptured. BUT HOW WRONG THIS TURNED OUT TO BE. The 2000 reunion on the Gold Coast was just as successful and just as special. It provided new opportunities to renew acquaintances for those who served together and had lost touch over the last thirty odd years. Some who attended Wodonga couldn’t make it this year, but many who couldn’t attend in ’99 managed to make it to the Gold Coast. So the special bond between mates was reinforced once more. A total of 97 guys and wives, including members from the original detachment, to members who closed the unit down, attended the reunion activities, some for five days, some for two days, and a few who lived locally attended the Reunion Dinner and Anzac Day services. The reunion itself was spread over five days, commencing on Good Friday, 21st April and concluding on the night of Anzac Day, 25th April 2000. For those on the five day package; Friday the 21st was an arrival / meet and greet day around the pool at the Harbourside Resort, Southport, with a visit to the fish markets, in the evening, for a “Good Friday Fish & Chips” on the beach. On Saturday morning everyone boarded the coaches to Surfers Paradise to spend the morning cruising the waterways and canals of the rich and famous. Saturday afternoon a group of the ladies (and a couple of the guys) wandered off to ‘Harbour Town’ for some heavy shopping, while the remainder spent another pleasant afternoon around the pool, imbibing in the amber fluid. Saturday evening was spent at the Southport RSL Club where a couple of the group managed to lighten the RSL’s coffers of a couple of hundred dollars. Sunday morning saw everyone board the resort coaches and set off to Brisbane to the Riverside Markets, where guys and their wives headed off in various directions to browse and shop. Around lunch time everyone met at the Treasury Casino for a couple of hours before heading back home to the Gold Coast, with a stop at the Beenleigh Rum Distillery on the way. Monday was a ‘free day’ and the theme parks and shopping centres got a beating. Monday evening saw a very important part of the proceedings with the Reunion Dinner at Horizons at Sanctuary Cove. About a dozen guys, who live locally and weren’t taking advantage of the packages, joined us all at Horizons. The location was perfect, food delicious, and the company fantastic. Tuesday – Anzac Day, saw about a dozen hardy souls attend the Dawn Service at 4.30am. All the guys lined up at 8.15am for the Parade at 8.45am, while the ladies walked a couple of blocks to Anzac Park to line the march route. To say we were the highlight of the Parade would not be boasting. Our Banner, carried by John Faram and Bill Dobson, made a commanding sight as we approached Anzac Park marching proudly in well formed ranks led once more by Mike Clark the OC of 1 OFP (1968). During the Service a wreath was laid on behalf of the Ordnance Field Park by Graham Alexander and Michael Grosse. Following the ceremonies, we all returned to the resort to change and then left by coach to Mt Tambourine for a picnic lunch. On the way back, following the picnic, a stop off was made at the Canungra Hotel for an hour and a drive through Kadoka Barracks, greatly changed though still sporting a ‘confidence course’ and tower on the river, which most had some ‘fond’ memories of. Back at the resort everyone settled in for a final night together. Wednesday dawned and farewells began with a promise to meet again. The friendships forged cannot and will not be forgotten. All who attended the reunion resoundingly agreed that we must meet again, and this was planned for Anzac Day 2003, with Alice Springs chosen over Darwin or Cairns.